From the top, mostly stock. Note the scoop and servo placement. A stock E-Spresso is an indoor pylon racer powered by an IPS direct drive can. 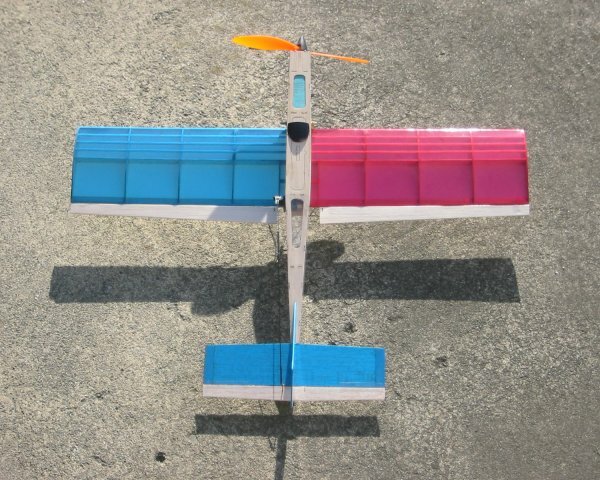 It's one of the many extraordinary balsa kits from Stevens Aero. I recommend them all, especially the G-Ride if you can stand such a big plane. My original idea was to remotor the 'Spresso with an 11-gram LPS "B" drive and fly it in the street by my house. It worked, but was just barely airworthy and at such slow speeds could roll out easily. Eventually that caused it to crash. However, it handled so nicely I couldn't just leave it like that. Besides, having built one I thought I knew just how to rework it and get it right. I almost always think this after building a kit, and suspect I should always just get two so I can figure out what I don't like about the first build. But I almost never actually get around to it. First, I used an LPS 4.8v "C" drive as Bill Stevens specs out for his Micro Cap 232 (a very tempting plane). Then I shifted a few other things around, but we'll get to that. Interesting to note the lower cutout in the motor mount exactly accomodates the drive. Did Bill consider this motor option at some point? It's secured by four screws, two with rubber bushings. You can also see the switch and hood scoop (neither is stock). I added the scoop (made from a KFC spork cut down and sanded) because I've blocked some front air flow with the gearbox and wanted to make sure the battery stayed cool. Besides, it's ginchy. A switch is necessary on planes where you have to remove the wing to install the battery -- at least I think so, especially if you need to cut power urgently. Not so obvious in any of the pictures is the elevator servo relocation. It's now vertical rather than horizontal and moved just slightly rearward to keep it out of the battery/receiver box (which is quite crowded enough as it is). The wheels have been relocated from wing-mounters. Note the post for the rubber band that secures the front of the wing. The stock setup is a true weirdness of the kit. 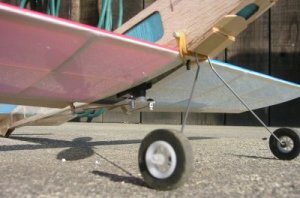 I could not figure out how to get the rubber bands from the front post to the rear without interminable fussing with the aileron control wires. This would not be a problem in the single aileron 'pylon' configuration, but is quite a problem for sport. So I put a lip on the rear that the wing slips into and a single post-mount rubber band in front. When I relocated the wheels I put them too close to the wing's leading edge and cramped my rubber band. Design is hard, says Aeronautical Engineer Barbie. The wing-mounted wheels killed my first E-Spresso when it banged in a bit hard recovering from a slowdown stall. It wasn't that bad a bump, but the extremely light wings couldn't hold the strain. I wasn't quite ready to give up on wing wheels when I first built this rev, but a very slightly ungentle landing unseated the new landing gear , so that was it for me. I relocated them to the fuse, and it can now bounce around to its heart's content with no damage. I no longer consider wing wheels viable on a plane that stresses light weight. Oh, and I left off the complicated wing washout tips. Perhaps they're an asset -- I'll never know. I skipped them the first time for aesthetic reasons (and may have doomed my tiny-motor version with that decision) but the second time I carefully considered all the hassle they'd incur and (expletive deleted) that noise. Okay, the point. Does it fly? You betcha! The airframe and wing are a wonder of small, lightweight design and it really does fly extremely well. Everything you can do without a rudder is smooth and effortless. It looks in control and command even in a fairly stiff breeze. It's one of the niftiest little planes I've ever seen. I may at some point be forced to install rudder control. For hard numbers, it's a 22-inch span and 19.5 inches long. 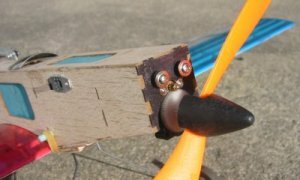 Motor is a GWS LPS-RLC-CS (6.2:1, 4.8 V, 21.33 g) with 7060 prop from Perry at Aeromicro in Cupertino, California. Two Pico servos, GWS Pico receiver and ISC-100 speed control. GWS light foam wheels and .047 music wire for the gear. Flying weight with battery (after all my bloaty mods) is 4.1 ounces.